If you’re in the market for window treatments, you know the selection can be overwhelming. Add to that trying to determine whether you need UV protection or light control, whether you need energy efficiency or beauty, and it can seem like you’ll never find the right treatment. However, Hunter Douglas offers window fashions that can take care of all of your needs. To start, look at the Duette Honeycomb line—now might be a great time to buy. Talk to a trained consultant at Windows, Walls & More in Bloomfield Hills. We’ll be happy to talk about the benefits. Honeycomb shades have been around for over 30 years, and they continue to offer superior privacy, insulation, and light control. With their honeycomb design, the shades keeps a room warmer in the winter and cooler in the summer. When the shade is lowered, you can actually feel the cold or hot air disappear, because as hot or cold air passes through the material, it is trapped in the honeycomb-shaped cells. This allows your room to stay comfortable. 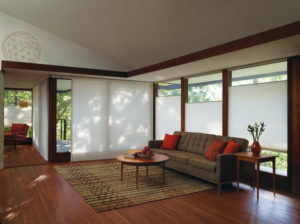 The Hunter Douglas Duette® honeycomb shade is one of the best on the market. With exceptional beauty and energy efficiency, this shade is a solid choice. And what’s best is that they might be eligible for a tax refund in 2016. Talk to a trained consultant for details! NEW UltraGlide® Wand – This child-safe, retractable cord system has a newly designed decorative wand/tassel that coordinates with the rail color to beautifully accent any décor. New Vertiglide™ Honeycomb Shade With PowerView™ – Vertiglide turns the Duette fabric 90 degrees so the fabric can be operated vertically instead of horizontally, which makes it ideal for glass sliding doors and large openings. New this year is the addition of PowerView Motorization. You can now use smart home technology to program or automatically adjust your Vertiglide with your remote or smart device. NEW Seamless Duolite™ Design – Duolite features two different fabrics for your single window opening. The top fabric panel is sheer fabric that is fused together with a bottom fabric panel. The bottom panel may be semi-sheer, semi-opaque or opaque fabric. The Duolite feature offers a multitude of ways for you to manage your light and privacy needs.